One of the key issues that President Trump campaigned on (and won on) was finally addressing jihad and sharia in an honest and forthright manner. And while I have cringed a bit when I hear President Trump use the term “radical Islamic terrorism,” it is light years ahead of what President Obama or President Bush ever said. President Bush used the term “islamofacsist” once, and was beaten back so brutally by jihad-linked Islamic groups such as CAIR that he never said it again. Is that any way to win a war? And radical Islam is ….redundant. Mike Flynn’s resignation was a major setback, but the selection of Hayward (who refused it) and then McMaster indicated that President Trump was caving to RINO establishment dhimmitude. McMaster claims using the watered down term “radical Islamic terrorism” is unhelpful — not because it is diluted, but because it isn’t accurate, because the terrorists are “un-Islamic.” Madness. This is absurd. First off, Jasser lives in his own Islam — considered heretical. He would be killed as a “hypocrite” and “apostate” under Islamic law. He’s been kicked out of his mosque twice. We have crossed swords before and battled about his fallacies here. Is Gorka for real? The Jordanian pilot was brutally murdered because he wasn’t Muslim enough. The ISIS opposes Jordan because they work with the US and have made peace with Israel — a shaky peace, but peace nonetheless. I suspect that Trump’s new immigration policy with respect to Muslim migrants from jihad nations will be watered down to the point of irrelevancy. Huge thanks here to Mr. John Guandolo for his much-needed analysis on these terrible appointments. Gaundolo is a 1989 graduate of the U.S. Naval Academy who took a commission as an Officer in the United States Marine Corps. He served with 2d Battalion 2d Marines as an Infantry Platoon Commander in combat Operations Desert Shield/Storm. From 1991-1996, he served in 2d Force Reconnaissance Company as a Platoon Commander, Assistant Operations Officer, and the unit’s Airborne and Diving Officer. During this time, he also deployed to the Adriatic/Bosnia. He served for one year as the Unit Leader for the CINC’s In-Extremis Force, directly reporting to a Combatant Commander in a classified mission profile. Mr. Guandolo was a combat diver, military free-fall parachutist, and a graduate of the U.S. Army Ranger School. The new National Security Advisor – Lieutenant General Herbert Raymond McMaster – and the Counter-Terrorism advisor to the President of the United States – Sebastian Gorka – both unequivocally state the “terrorist” threat America faces has nothing to do with “true” Islam. Both men are catastrophically wrong and, therefore, are leading America down a disastrous road towards defeat. 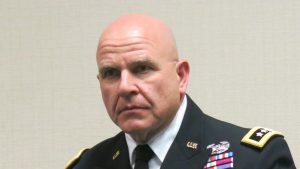 The New York Times, Guardian, and CNN all report Lt General McMaster told members of the National Security Council Thursday he felt “radical Islamic terrorism” was an unhelpful way to describe terrorism because becoming a terrorist is actually “un-Islamic” in the first place. This is incoherent and factually wrong. LtGen McMaster wrote a book entitled “Dereliction of Duty.” He may want to look in the mirror to see if he is doing the same thing in this war he accused President Johnson of doing in Vietnam. 100% of all Islamic doctrine, from elementary, junior high, and high school Islamic text books as well as the highest authorities in Islamic jurisprudence, to include Al Azhar University in Egypt, all clearly and doctrinally state Islam is a “complete way of life (social, cultural, political, military, religious)” governed by sharia (Islamic Law). 100% of all sharia mandates jihad until the world is under Islamic rule, and 100% of sharia only defines “jihad” as warfare against non-Muslims. The violence Al Qaeda, ISIS, the Muslim Brotherhood, the Boston bombers, the attackers in Paris, the Fort Lauderdale shooter, and all the jihadis we have faced over the past 20 years quote authoritative Islamic doctrine in support of what they do. Al Qaeda and ISIS have never misquoted sharia in furtherance of their actions. In the last 15 years it has been made clear – the more muslims study Islam and sharia, the more likely they are to support and participate in jihad. So the questions remains…what the hell is Lieutenant General McMaster talking about because he is not talking truthfully about a real and present danger to these United States? He is doing exactly what our enemy wants him to do – creating an imaginary target for us to chase while our real enemy prepares to defeat us. Nearly 16 years after 9/11, the Global Islamic Movement has taken down nations, expanded its power, and defeated the United States in the wars in Afghanistan and Iraq because leaders like McMaster decided they were too busy to stop and learn the enemy threat doctrine – Sharia – and instead have been given a counterfactual understanding of our enemy by Islamic advisors who are all batting for the other team. The President’s Counterterrorism advisor, Sebastian Gorka, is “over the moon” LtGen McMaster is the new National Security Advisor. However, Gorka’s lack of honesty about the Islamic threat raises much more serious questions. Some have been lulled into believing he is on the right track because he uttered the word “jihad” but defeating this enemy takes more than pretending to know what you are talking about. Utter nonsense. There is one version of Islam and one Sharia. To say otherwise is to be factually wrong, but also dangerous when national strategies are being built off that utter nonsense. When one’s duties include national security responsibilities, one has a professional duty to know the enemy or do due diligence to know the enemy. To fail to do so makes one professionally negligent in one’s duties. When people die (Ft Lauderdale, Boston, Orlando, Ft Hood…) because a person is unprofessional in his/her duties it is called “criminal negligence” and doctors and lawyers go to jail for such behavior. 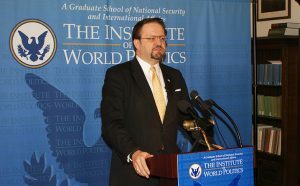 Several years ago at a town hall presentation hosted by Washington, D.C. radio station WMAL, Sebastian Gorka stated “99.9% of muslims do not support terrorism (jihad)” despite a mountain of evidence and polling data proving this comment untrue, and the fact the entire purpose of Islam is to wage jihad until the world is dominated by Islamic rule (sharia). Dr. Gorka also writes in his book, Defeating Jihad, we are not at war with Islam (p.129) but our enemy is “the ideology of takfiri jihad” (p.123). This is what Islamic doctrine commands them to do. On page 144 of his book, Gorka ends with the call for the United States to spend billions of dollars supporting “Muslim reformers” in their “ideological war to delegitimize the message of holy war against the infidel and bolster modern interpretations of Islam.” This demonstrates Sebastian Gorka is either completely free of any clue of Islamic doctrine or is intentionally lying about what Islam actually teaches. Since these ideas and strategies to use “moderate Muslims” to ensure the “other version” of Islam wins are based in fantasy not reality, these policies will necessarily fail – and have failed the United States for 15 years. Is that Dr. Gorka’s intention? Does he not know that strategies to win a war must be based in the reality of who the enemy is? Why would Sebastian Gorka put forth such and idea when he knows what he is saying is untrue? Is it possible Dr. Gorka has remained strategically incoherent for 15 years during this global war? Is he working on behalf of some outside entity to intentionally mislead the President of the United States, or is he is simply putting his paycheck ahead of the American people and his duty. The United States will lose this war against the Global Islamic Movement if we do not clearly define the enemy and target the enemy. We cannot hit a target we do not identify and cannot defeat an enemy we do not target. Our warfighting doctrine calls for an analysis of our enemy based on how the enemy defines itself. We begin our analysis there. Something we have not done since 9/11/01. If we did, our entire national security apparatus, including our military, would have been studying and teaching authoritative sharia and more of our soldiers, Marines, sailors, and airmen would be alive today because of it. Keeping LtGen McMaster and Sebastian Gorka in their current positions will ensure America remains strategically incoherent and will guarantee our defeat in this war against the Global Islamic Movement. As always, this war will be won or lost at the local level because our federal government is still failing us. Next Ihre Papiere, Bitte! (Your Papers, Please): Are We Being Set Up for a National ID System?